Artix Entertainment tries to set it self apart from other game companies in a lot of ways but one of the most important is how much we interact with you guys. Any of you who follow my Twitter or like our AQW Facebook Fan Page know this to be true. We love talking to you and even when we don't love what we hear, we love that you care enough to tell us what you don't like and we try and fix it. Unfortunately, we are not always logged in to Twitter (we do sleep on occasion) and when we are, we all have a LOT of people talking to us (at this time I have 31,035 Twitter followers and Artix has nearly 47,000!) so If we don't reply to you it's probably because we either missed your Tweet or because we can't reply to every single Tweet. Please try and understand that there is no way that we can answer every tweet, much less meet up with every single person who asks to meet us in-game. We would never have time for anything else. Another thing to mention is that it is mostly the Devs who are on Twitter. Devs (or Game Developers) are the people who spend all week building each new release for you to play, and fixing the bugs that you have reported on the BUG FORUMS. We also have a lot of other jobs dealing with game development and community outreach. All that stuff takes up the entire week (which is why some releases come to you a little later than others) and our jobs don't leave time for much else. In the rare cases when we DO find ourselves with extra time, we make a Mid-Week release or work ahead on new functionality! So you can see that we Developers keep pretty busy with our own stuff. That's why we have Moderators to help you and protect you in-game and Player Support to help you outside the game with account and payment issues. Nythera, Zazul, Memet, Neveya & Lady Tomo make up the Player Support team. Their primary job is taking care of you and your account issues. They do a fantastic job and are often overlooked for all the effort that they put into making AE function. Reens, Stratos and their team of Moderators handle a lot of in-game issues. Everytime someone is using foul language or trying to scam or trade accounts, it is THESE heroes to quietly step in and take action to try and keep the game as fun as safe as they can, and many of these mods are volunteers. 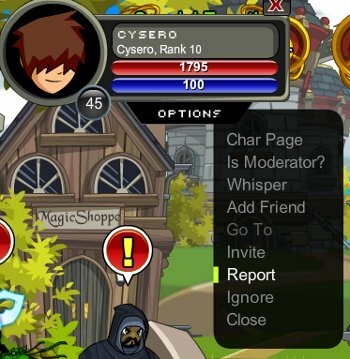 They are giving their own time to sort through reports for no reason other than they really CARE about making AQW a safe and fun place for everyone, but they need YOUR help. Each team has their hands full. That is why we Dev's can't help you with your account or payment issues when you ask for help over Twitter. It's not because we don't want to, it's because it's not what we do and we literally CAN'T help you in most cases.